Unless otherwise specified, the large pictures on this page are of engines in the collection of The Upstairs Train and the smaller ones are from ebay auctions I didn't win. If you have a picture that you would like to share with the world of any of the engines not shown here (or a better picture of one that is shown! ), email them to me: theupstairstrain@yahoo.com. Click here for a list of the pictures I need to complete the Gallery. Click on an engine to see the train(s) it pulled. When I get all the pages built, that will work for all engines. For now, it only works for the ones I own. #310 Pennsylvania Pacific made only in 1946. #310 "American Flyer Lines" Pacific made only in 1947. 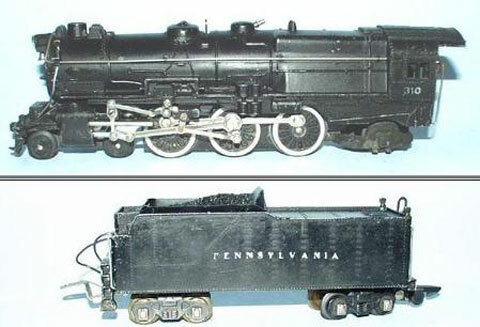 #312 Pennsylvania Pacific with smoke unit in the tender made only in 1946. #312 "American Flyer Lines" Pacific with smoke unit in the tender made only in 1947. #312 "American Flyer Lines" Pacific pre-production prototype with smoke unit in the boiler made in 1947. #312 "American Flyer Lines" PRR Pacific with smoke unit in the boiler made in 1948. There were also numerous other less notable variations. I am told that the Maury Romer interviews said these cut aways were made so the directors could see how things worked and approve or disapprove production of an item. These cut away locos were then used in the corporate sales center on the second floor so buyers from big stores like Sears and Macy's could come in and see what the product was all about, how it was made, and how it worked (and check out the massive layout up there) before they made their orders. When the change was made to smoke and choo choo in the boiler, these were used to show how everything fit and worked in the boiler. #312AC PRR Pacific made from 1949 to 1951. There were numerous variations in lettering, trailing trucks, and tender details..
#313 "American Flyer Lines" PRR Pacific made in 1955&1956. It came in two versions, small motor and large motor. #314AW PRR "American Flyer" Pacific with trailing truck on one-piece drawbar made only in 1949. 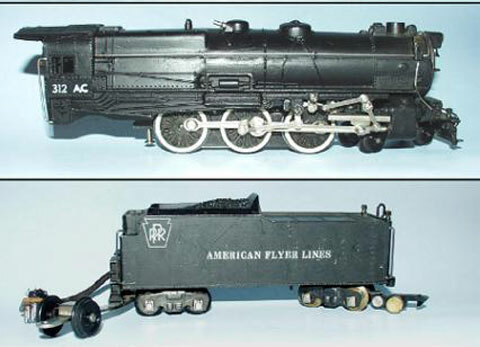 #314AW PRR "American Flyer" Pacific with diecast trailing truck and separate drawbar made only in 1950. 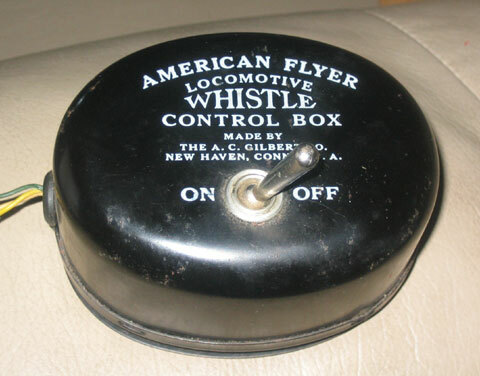 The #314AW used a different whistle controller than the familiar air chime whistle tube of later years..
#315 PRR "American Flyer" Pacific made only in 1952. #316 PRR "American Flyer Lines" Pacific made in 1953 & 1954. Show me the rest of the Pacific Steam Engines. This gallery will continue to grow and become more comprehensive as I collect more cars and as visitors like you send me pictures of the cars I don't yet have. If you have a car that you would like to share with the world, email me a picture: theupstairstrain@yahoo.com. Click here for a list of the pictures I need to complete the Gallery.